Our law office makes customer service a priority. While we often meet with clients in our office, we also make house calls in order to accommodate schedules. Drafting a will or trust is a highly personal task, so we want the people we are working with to feel as comfortable as possible. Likewise, if we are working with a business, we visit that company to get a comprehensive view of how we can best serve that client. The team at our law office combines decades of experience navigating a wide range of cases, including civil litigation, family law and mortgage refinancing. In fact, one of our attorneys has conducted more than 20,000 real estate closings. We are forward-thinking professionals who plan for immediate results as well as long-term strategies for success. This results-oriented approach is one of the reasons why our attorneys hold honors such as being named Rising Stars by Super Lawyers. 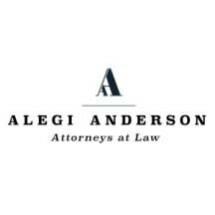 As a matter of convenience, Alegi Anderson, LLC, accepts credit cards.